`Robot Wars star ponders the ethics of Artificial Intelligence (AI) at Magee', Derry Journal, November 6th, 2016. `Engineering empathy for the future of life', UU Press Release, November 4th, 2016. ``Robot Wars' professor to discuss ethics of emotion-reading technology', Derry Journal, September 29th, 2016. `BLIS: where imagination meets engineering', Innovation Profile (Ulster University), Irish Times (Innovation Section), September 7th, 2015, page 3. `Digital StoryTelling Pioneer Set for LegenDerry Visit', UU Press Release, September 10th, 2013 (courtesy: Trina Muckian). 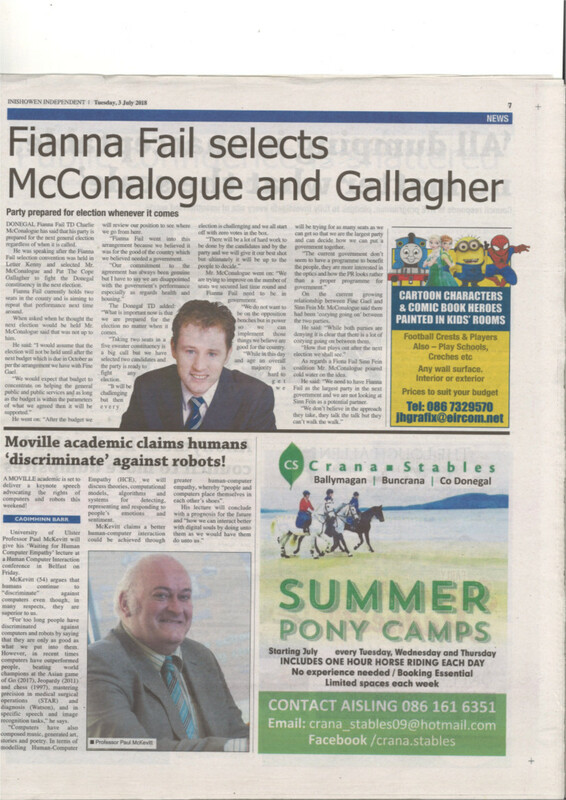 `Search for most life-like robot next week', Londonderry Sentinel, September 3rd, 2013. `Ulster to Unveil £3.5m Creative Industries Support Programme', UU Press Release, August 29th, 2013 (courtesy: Trina Muckian). 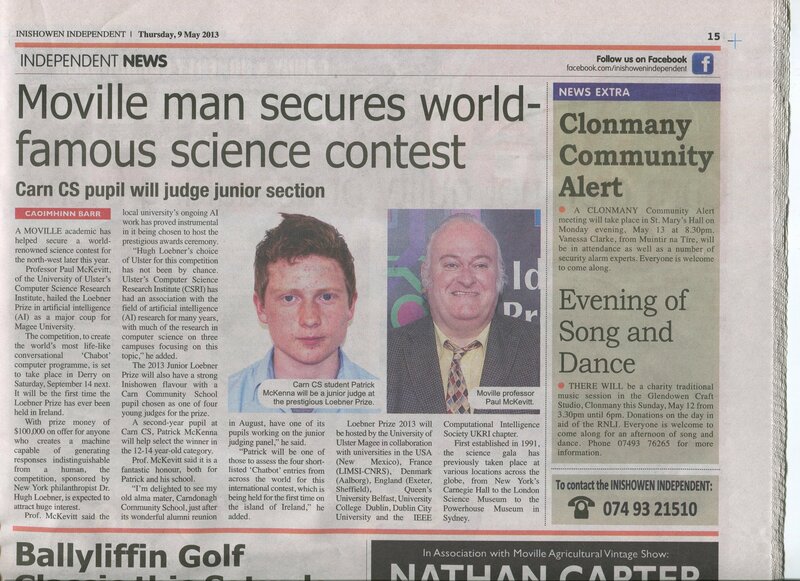 `Moville Man secures world-famous science contest: Carn CS pupil will judge junior section', Inishowen Independent, p. 15, May 5th, 2013 (courtesy: Caoimhinn Barr/Trina Muckian). 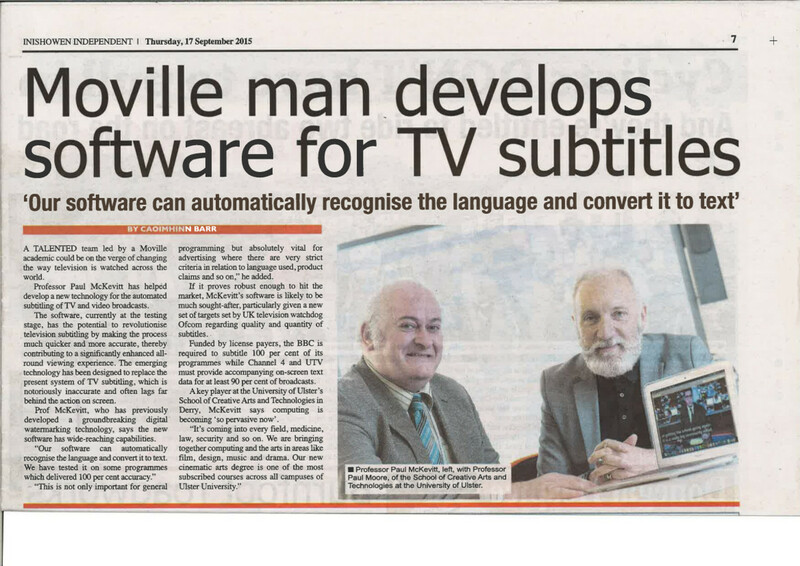 `The Turing Test', Londonderry Sentinel, April 29th, 2013. `Ulster Secures Loebner Prize 2013 Contest in Artificial Intelligence', UU Press Release, April 24th, 2013 (courtesy: Trina Muckian). HidInImage Ltd.: `400 Reasons to Invest in the North West', UU Press Release, February 7th, 2013 (courtesy: Patti Holly). `Magee casts edutainment research with 360 Production', UU Press Release, August 29th, 2012 (courtesy: Trina Porter). `Security through Obscurity - New Spinout Company gives 21st Century Twist to Ancient Science', UU Press Release, July 9th, 2012 (courtesy: Patti Holly). 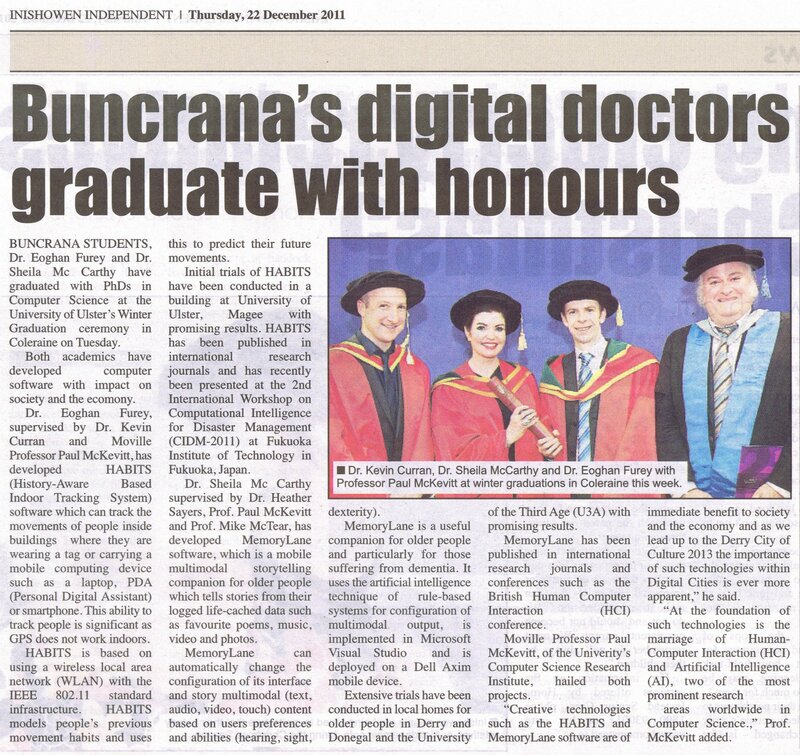 `Buncrana's digital doctors graduate with honours', Inishowen Independent, December 22nd, 2011. ``SET for Britain'', The Ulster Graduate, Issue 17, Summer, 2011 (page 17) (Karla Munoz). Unreliable music streams fixed by new algorithm, May 24th, 2010.